Burlington Mayor Miro Weinberger speaks in favor of universal background checks on gun sales at the rally. Ann Braden stood on the Statehouse steps Thursday in front of about 175 people who were rallying for background checks for all gun sales. 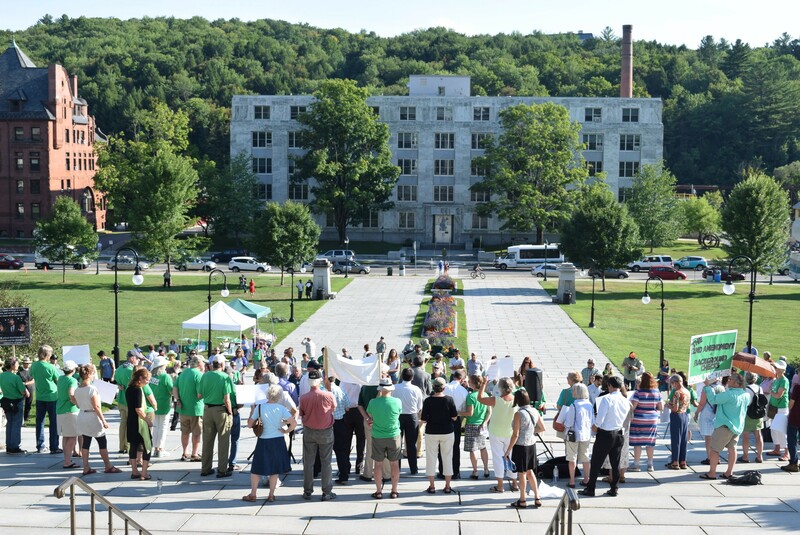 “I can’t tell you how amazing it is to see you all here,” said the Brattleboro mother of two young children, who founded the advocacy organization Gun Sense Vermont. Three and a half years ago, when she launched an effort to change gun laws in Vermont, the scene was much different, Braden noted. “All I felt was alone and powerless,” she said. Thursday’s crowd reflected a change in views among Vermont politicians regarding gun legislation. Standing alongside Braden were all three Democratic candidates for governor and all three Democratic candidates for lieutenant governor. “This is a sea change,” Sen. Phil Baruth (D-Chittenden), told the crowd. Four years ago, Baruth found himself alone in the Statehouse as he sought to ban assault-style weapons and met resounding opposition. Baruth organized Thursday’s event to rally support for legislation he plans to introduce in January that would require background checks for all gun purchases, including those made through private sales, at gun shows and online. Baruth said he is collecting cosponsors but won’t unveil the bill’s details until next year. He indicated the bill would include an exemption for transferring guns to immediate family members. Access to guns could become central in the general election race for governor. While all three Democrats competing for their party’s nomination in next Tuesday’s primary support universal background checks, both Republican candidates oppose any change to state gun laws. Speakers at Thursday’s rally acknowledged that passing legislation won’t be easy, but much of the focus was on how the conversation has shifted. “This is a new day,” said Burlington Mayor Miro Weinberger. 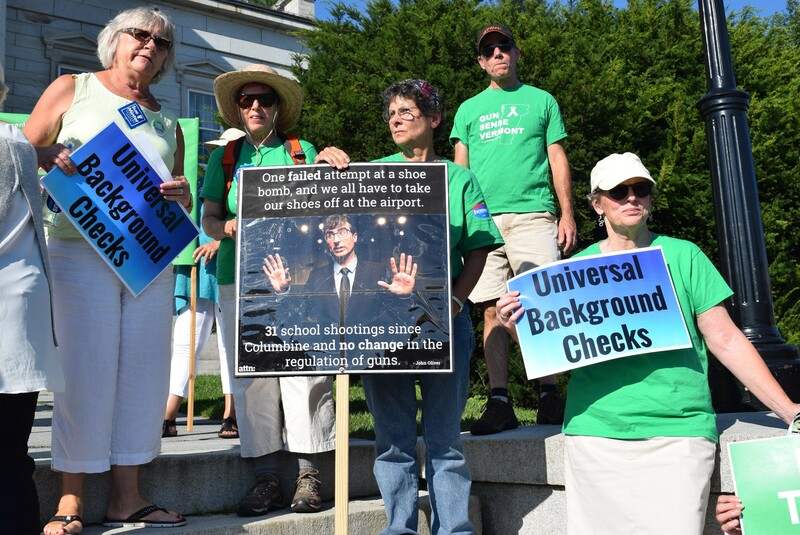 After Burlington residents voted in 2014 for several gun-control measures, Weinberger went to the Statehouse numerous times to ask the legislature to approve the changes to the city’s charter. The measures never made it out of a single committee. Matt Dunne, a candidate for governor, admitted to the crowd that he’s new to the cause. He grew up in Hartland in Windsor County, where hunter safety courses, he said, were taught in the school gym. He was among those who considered Vermont immune to gun violence, he said. “I don’t believe that is the case anymore,” Dunne said. Demonstrators supporting changes to state and federal gun laws. 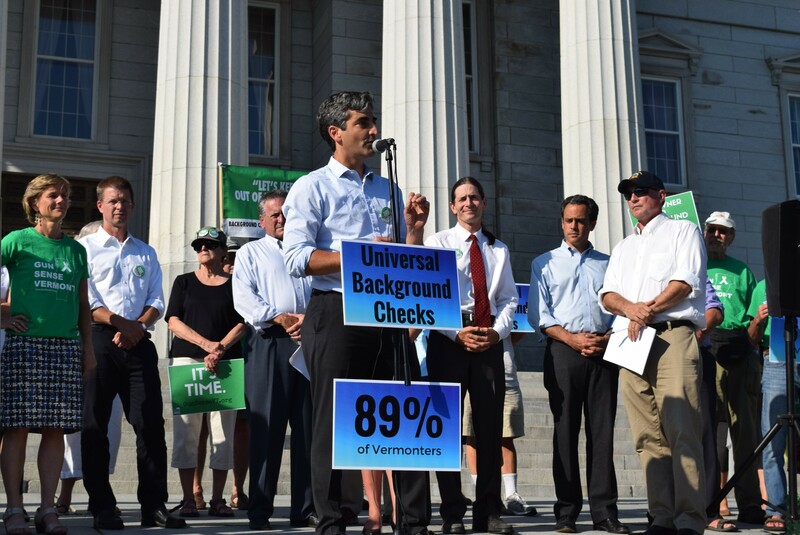 Sue Minter, who is competing with Dunne and Peter Galbraith in Tuesday’s Democratic primary for governor, noted that she is the first candidate for governor in Vermont ever to call for expanding background checks to private and online gun sales. And, she said, for the first time, the Vermont Democratic Party has included the issue in its platform. Minter said her interest in jumping on the gun issue stemmed from a “pivotal conversation” she had with Braden in a Brattleboro café. Galbraith pushed further, calling for a ban on assault-style weapons. Galbraith departed from the guns topic and lambasted Dunne and Minter for refusing to condemn last-minute ads being aired on their behalf by independent political action committees. “I urge you not to vote for a candidate who will not denounce that money,” Galbraith implored the crowd, noting that outside groups such as the National Rifle Association may launch similar efforts to oppose gun legislation. Voters will likely see groups on both sides of the gun issue trying to influence the November general election. Braden said after the rally that Gun Sense Vermont has raised $20,000 and will work to help elect political candidates who support universal background checks. Gun-rights activists, who argue that Vermont needs no changes to its gun laws and that their opponents are really seeking gun registration and confiscation, have likewise promised to support candidates who will fight gun-control legislation.